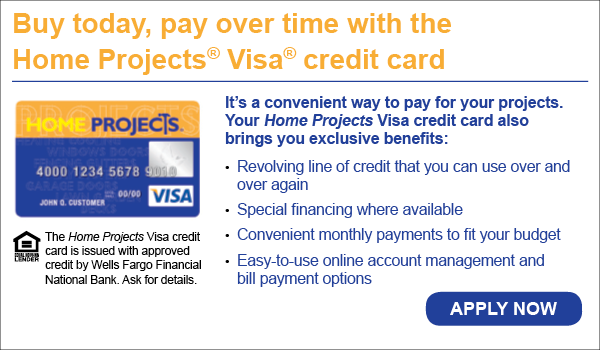 *The Home Projects® Visa® credit card is issued by Wells Fargo Financial National Bank, an Equal Housing Lender. Special terms apply to qualifying purchases charged with approved credit at participating merchants. Regular monthly payments are required during the promotional (special terms) period. Interest will be charged to your account from the purchase date at the APR for Purchases if the purchase balance is not paid in full within the promotional period. For newly opened accounts, the APR for Purchases is 27.99%. This APR may vary with the market based on the U.S. Prime Rate and is given as of 04/01/2015. If you are charged interest in any billing cycle, the minimum interest charge will be $1.00. If you use the card for cash advances, the cash advance fee is 5.00% of the amount of the cash advance, but not less than $10.00. Offer expires 12/31/2015. **The Home Projects® Visa® credit card is issued by Wells Fargo Financial National Bank, an Equal Housing Lender. Special terms apply to qualifying purchases charged with approved credit at participating merchants. The special terms APR will continue to apply until all qualifying purchases are paid in full. Monthly payments of at least 5.90% of the purchase balance are required during the promotional (special terms) period. The APR for Purchases will apply to certain fees such as a late payment fee or if you use the card for other transactions. For newly opened accounts, the APR for Purchases is 27.99%. This APR may vary with the market based on the U.S. Prime Rate and is given as of 04/01/2015. If you are charged interest in any billing cycle, the minimum interest charge will be $1.00. If you use the card for cash advances, the cash advance fee is 5.00% of the amount of the cash advance, but not less than $10.00. Offer expires 12/31/2015. 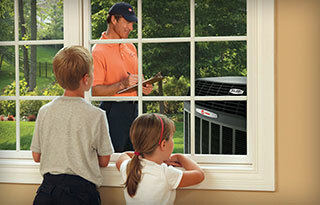 NW Ventilation is a licensed, bonded HVAC company (heating, ventilation, and air conditioning) locally owned in Camas, WA serving the greater SW Washington / greater Portland area.